Due to the presence of microcracks at the interface of mortar-aggregate, plain concrete is considered as a brittle material. 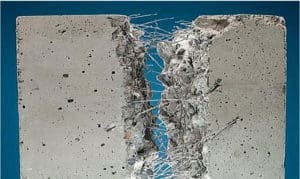 It has been found that these low tensile strength and impact resistance can be significantly improved by adding a certain amount of fiber in the concrete mix. The fiber may be of steel or glass of asbestos. Such a concrete containing fiber is called fiber reinforced concrete. The improvement of weakness depends on several factors such as materials of fiber, shape, and size of fiber, volume, and pattern of distribution in the concrete mix. Fiber reinforced concrete can be categorized into following two types. 1. Steel Fiber Reinforced Concrete. 2. Glass Fiber Reinforced Concrete. Steel Fiber Reinforced Concrete or SFRC is produced by mixing little amount of steel fibers in the elements of concrete. Steel fibers are regularly prepared by cutting 10-60 mm length of low carbon steel wires diameter of 0.25-0.75 mm. Other than round fibers, flat steel fibers are moreover normal in use. Flat sheet steel fibers are delivered by cutting 0.15-0.40 mm thick plates in widths extending from 0.25-0.90 mm, furthermore length 10-60 mm. Steel fibers tend to group together which makes troubles in guaranteeing their uniform dissemination in the concrete. This trouble can be overcome by utilizing fiber bundles. The steel fiber in the fiber bundle separates out at the time of concrete mixing and get aggravated in an irregular design in the concrete mix. By adding of 2-3% of fibers (by volume) it is conceivable to accomplish a few circumstances increment in the flexural strength of the concrete and further increase in crack resistance, explosion resistance, and different properties of the concrete. SFRC is suitably used in the construction of pavements, bridge decks, pressure vessels, tunnel lining etc. Glass fibers are normally produced from 200 – 400 different filaments that are lightly bonded to create a strand. These strands are sheared into different lengths for making cloth, mat, and tape. By using conventional mixing method only 2% fibers can be mixed in 25 mm length. It is found that when the diameter is decreased, the strength of glass fiber is significantly increased. That’s why they can not be used in longer spans. Suitable treatment is also required to utilize the glass fibers as micro reinforcement because it gets corroded due to the effect of alkali present in the portland cement. The tensile strength and impact resistance of concrete can be increased by adding 10% of fiberglass in the concrete. Fiber reinforced concrete is mostly used for manufacturing precast products such as spun pipes, wall cladding etc.